They say that we are a product of our upbringing...that who we are today is based on both our nature and our nurture. The experiences we have all had make us unique, and this reflects on every part of our personality and our character. 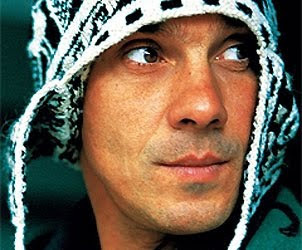 Manu Chao's upbringing reflects a new Europe, one that has changed remarkably in recent decades. Born in Paris to a Galician father and a Basque mother, Manu's music is a fusion of the many cultures and people that have radically altered European cities. Singing in a mixture of Spanish, French, Portuguese, English, Arabic, among others, Manu truly is a child of the new Europe. One can immediately pick up various influences from Manu's music. An African drum here, a caribbean horn there. Melding together the music of the streets of different cultures, Manu's music is unique and alive. "Clandestino," the first song of his first solo album, Clandestino, is a story about immigrants coming to Spain. Clandestino, translating to underground, refers to immigrants in Spain who are there without papers, those living each day illegally, not sure when they will be caught and sent home. In the song, Manu talks about the Africans who try each day to boat across the Mediterranean, from the Spanish "colony" of Ceuta in Northern Africa through the straits of Gibralter. If they do make it, they become "ghosts in the city," wandering the streets with no identity. This is a jam and a half because it is classic Manu. Over a simple guitar riff and maracas, its almost as if we hear Manu singing on the side of a street, lamenting over the hardships in his life. Manu takes a strong poke at governments, when saying that his life is prohibited, says the authorities. A perfect introduction to the rest of his brilliant album, musically the song is what a new Europe could be, a cohesive harmony of differing sounds and influences. Manu's family left Spain to escape Franco, but his songs reflect a new Spain, a proud and unique mixture of backgrounds and people.